Portugal's star soccer player Diamantino Matamouros misses a crucial penalty shot in the World Cup and then breaks down in tears in front of the flabbergasted crowd. His passage from worldwide hero to pitiful zero is brutal. That same day, his father/manager dies of a heart attack. 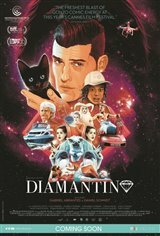 Diamantino’s wicked twin sisters take over his career, manipulating and exploiting him.